Isn’t horrible to lose all the data from your PC due to some crash or something and your lack of prudence? 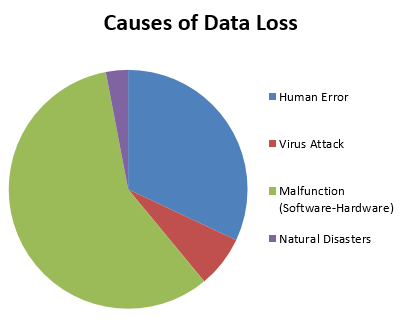 Below, you can see a pie chart that highlights the overall causes of data loss (based on empirical data and data provided by Protect Data). Whatever the reason, it is certain that you are in constant need of solid protection and online the proper backup is able to provide such protection. Rather than regretting not having been more careful and considerate, you should feel free to come up with ways that will allow you to sleep tight at night. Keeping regular backups is always the safest thing to do, both local and offsite. Of course, a local backup system includes some sort of storage device (like a USB or a hard drive or even a special device that you have devoted to backing up all of your data and keeping somewhere safe). An offsite backup copy of your data is typically offered to you by an online backup service. Does that ring any bells to you? Alternatively known as a remote or cloud backup service, this is a service that provides Internet users with the storage space and all the other details required for secretly saving their data online. There are numerous online backup providers that are adequately equipped and thoroughly educated on computing, so as to offer high quality services and integrated solutions for cloud storage of all kinds of data. In order for the data to be kept protected, encryption is used and some other really helpful features that are meant to facilitate the experience of the customers. Prior to making your decision as to which provider you are going to trust to protect your data on the cloud, be sure to check these factors listed above! Let’s move forward with naming the 5 best online backup services that offer exquisite services and can help you feel absolutely safe, shall we? Backblaze: Backblaze is a service offering unlimited online backup, with headquarters in San Mateo of California. Backup on your Mac and PC is going to cost you $5 monthly, $50 yearly or $95 biannually (per computer). You can request a free trial, after signing up to their official website. Read our complete Backblaze review. Carbonite: Carbonite provides online data backup that suits all kinds of needs. Personal plans start from Basic at $59.99 per computer annually in Windows or Mac and stretch to $99.99 for Windows, if you add external hard drive backup and mirror image backup. For more features, the price reaches $149.99. There is a free trial and unlimited storage is offered. Read full Carbonite backup service review. Crashplan: If you are looking for free online backup, Crashplan from Code42 in Minneapolis has got a free plan that includes automatic backup to local hard drives and other trusted computers. Apart from that, there is the individual plan starting at $3.96 per month and the family plan from $8.96 per month. Business and Enterprise plans are also available. Read Code42’s Crashplan comprehensive review, we covered. Bitcasa Cloud Storage Platform: Bitcasa was launched back in 2011 and it is based in San Mateo, CA. It provides end to end encryption that matches various needs. There is a free version limited to 5GB that you can request. Premium Plan stretches to $10 monthly and offers you 1TB, while Pro Plan reaches 10TB and costs $99 per month. Get to know everything out this provider, in our detailed Bitcasa review. Norton Online Backup: Norton by Symantec has got a cloud backup plan that allows you to store up to 25GB from up to five different home PCs per month. It runs on Windows and Mac OS and it costs $49.99 annually. If you need extra storage space, you can expand at any time without much money added overall. Read our Norton online backup review to know about this provider, in detail. We have completed our list with the best online backup services that you can find to this date. You are encouraged to visit their sites and find out more about what they have got to offer you, before you make up your mind. Nevertheless, you ought to go the extra mile and run regular backups for the data stored on your PC. This is crucial, if you wish to be kept safe and to eliminate any chances of losing your precious data one way or another. Do tell us what you have decided and how it has turned out to be!